Was It Right Or Wrong? Yes. When I was at the firm, I facilitated a program about Situational Ethics. Various hypotheticals were offered up for discussion – all work-related obviously, but ranging in subject from employer/employee dynamics to issues of client confidentiality. The realities of workplace demographics were a primary driver for the creation of the program. The firm had grown exponentially and people were not staying ‘from cradle to grave’, challenging the cultivation of loyalty and a deep understanding of the commitment to work reflective of unparalleled integrity. Certainly dedication and tenure along with personal and professional accountability are very strong motivators for people to do the right thing. We all know when something doesn’t pass our ‘sniff test’ – but what we then choose to do is another issue entirely. As people become more and more anonymous within companies as a result of technology, higher turnover and generational perceptions, the risk of fraudulent and/or dishonest behavior escalates. Even with the most sophisticated processes in place, someone will still knowingly enter their time incorrectly, submit inappropriate expenses for reimbursement, falsely assert that something did or didn’t get done, etc.. Are any of these ‘wrong’ enough? Where does the responsibility rest? Is it the individual’s responsibility to maintain his/her integrity in the face of an ‘every-man-for-himself’ workplace? Is it the employer’s responsibility to underscore its absolute conviction to such a principle? And if the answer involves the latter, how does one respond when some misdeeds are overlooked? I write this with no answers. 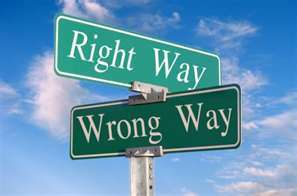 On the one hand, I believe in the very basics of right and wrong – do the right thing by the people who work with and for you, don’t take what isn’t yours, tell the truth…On the other hand, have there been times when what I thought was the right thing, wasn’t? Have I always told the truth to my boss? Yes, there have been times when my actions probably were ill-considered, and knowing some of the bosses I have had in my career, there have certainly been occasions where his/her lack of receptivity, defensiveness or demeanor led me to couch my words or obfuscate them to the point of being completely opaque. Does it matter if my intentions were good even if the outcome reflected otherwise? I suppose that is why the elements of a given situation often drive the answer to these questions. Rights and wrongs can often be variants of black and white, not absolute in any way. Certainly, I still hold that if one’s actions are guided by a belief that first and foremost we are here to offer the best of who we are to others, we’re on the right track. But beyond that, I’m not sure there are too many other absolutes. What do you think? Posted on May 14, 2012 by mimijk •	This entry was posted in discretion, leadership, life lessons, management, mindfulness, training and tagged Human Resources, Philosophy, Situational Ethics, Work. Bookmark the permalink. Another stop by the Karma Truck that hit home. For our generation, I’d like to think integrity is a “no-brainer” however, in a world where power is an aphrodisiac, it has become quite hard for people to do the right thing all the time. And, what’s right for one isn’t always right for all. Apparently, I am still learning the difference. That being said, at the end of the day, that’s integrity you see as I pull the covers over my head and fall asleep. And, I’m sleeping. So, I’m doing something “right”, right? Good point!! If you’re able to sleep at night, that’s a good sign! 1. Is anyone hurt by this action? If so, don’t do it. 2. Do I know that its wrong under any circumstance? ( Stealing, falsification, harming another fall into this category. 4. Do I have to do anything right now? Can I sleep on it and act tomorrow? 5) If I read about my action in the front page of the NY Times tomorrow (or any section for that matter), how would I feel? 6) If my child asked me if it was ok to do the same act, what would I tell him/her? Funny, I responded to an earlier post with the same question (#5)…The same question posed by your child is a really good question to pose…thanks! Honesty and integrity are do very important to me…however, because I am a pleaser I have a strong tendency to tell people what I think they want to hear–even if it means lying. And that’s why I believe it is impossible for an employer to make an employee have integrity. At some point, I believe, individuals must take personal responsibility for themselves, including wearing seatbelts, texting while driving and using screen. Honesty and integrity are do very important to me…however, because I am a pleaser I have a strong tendency to tell people what I think they want to hear–even if it means lying. And that’s why I believe it is impossible for an employer to make an employee have integrity. At some point, I believe, individuals must take personal responsibility for themselves, including wearing seatbelts, texting while driving and using sunscreen. I love the quotes Carrie – and I also totally appreciate the desire to please. At the end of the day your perspective is also right – no one can teach integrity – one can only remind people of its inestimable value. Great article and I agree this topic can fall into gray areas at times. I hold on to the golden rule as it pretty much keeps you on the right track. That is as long as you take the time to really think about how you would feel if what is being questioned was done to you. Too many times we just jump without looking and think once we are headed downward. Couldn’t agree more! Thanks Tina!